How to Prepare Your Yard for a New Hot Tub | Austin TX - Paradise Spas & Outdoors Living | Hot Tub Store, Swim Spas, Patio Furniture, and More! This is it. You’re finally bringing your baby home. Well, not a baby baby but a hot tub baby! But just like you would prepare your home for bringing a baby home, you’ll need to prepare your home for your hot tub baby! So, let’s talk about how to prepare for an outdoor hot tub. Hot tubs can be installed inside the home or outside in your yard and the different locations require different preparations. First things first- select the site for where the hot tub should rest outside. Make sure the area you are placing the hot tub in will fit the hot tub! This site should be in a location where there is good available drainage. Don’t want the hot tub to be surrounded by water or mud from weather or sprinklers. You’ll need to check the surrounding area to make sure there are no overhead trees or shrubs that could create lots of debris. Also, stay away from overhead power lines. Most importantly, make sure the area does not block access ways to your house or neighboring septic tanks, electrical or sewer lines, etc. Allow easy access to a water source. Usually, the hot tub maintenance causes it to be drained a handful times a year and will need to be refilled. Typically, it is refilled by a water hose. Make sure your garden hose is close enough to refill! Depending on the type of hot tub you’ll need an electrical source such as an electrical panel or outlet. Some hot tubs require a source that is connected by a professional electrician, others require a direct plug into a 15-amp outlet. Consult your instruction manual to find out which source you’ll be needing. Once you tick off those boxes, the next step is to prepare the ground! The ground will need to be level, you can do this by eliminating any slopes, bumps, and holes. Make sure to remove any debris and rocks that can interfere with the site. It’s important to steer clear of any ground that has large tree roots. Once the ground is flat you can move onto the next step! Now you’ll need to provide a layer of gravel onto the location that you just leveled. The gravel helps prevent an area to become muddy. This layer can be up to four to six inches thick, depends on the size and weight of the hot tub. Pack down the gravel and keep that area level! Once you complete this step you’re ready for your hot tub to be placed! Follow these steps and any instructions your hot tub comes with for preparations. You’ll be sitting back and relaxing in your new hot tub baby in no time! If you live in the Austin, TX area and are considering a hot tub or swim spa, Paradise Spas and Outdoor Living is the place to visit. We are a luxury hot tub distributor and carry the highest quality brands that are packed with premium options and feature the best technology, performance and luxury. 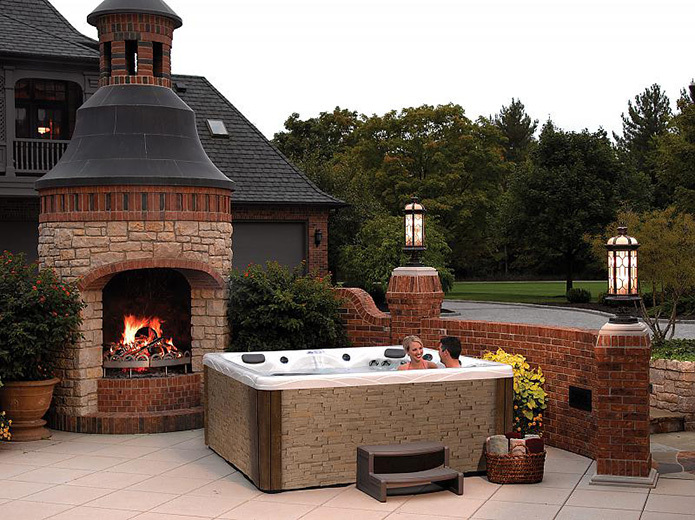 Whether you want a hot tub for relaxation, improving your health, or just pure enjoyment, Paradise Spas can help you find the perfect hot tub to meet your needs desires and budget. Contact or visit us today to learn more about purchasing your new hot tub!